(CNN) -- Governments and health officials around the world continued to take steps Tuesday against the outbreak of swine flu that has killed scores of people in Mexico and spread to the U.S., Europe and possibly Asia. 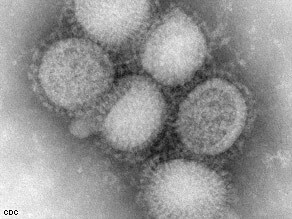 A preliminary image of the swine flu virus from the Centers for Disease Control. By Tuesday, Mexican health officials suspect that the swine flu outbreak has caused more than 159 deaths and roughly 2,500 illnesses. The World Health Organization says at least 105 cases have been confirmed worldwide, including 64 in the United States; 26 in Mexico; six in Canada; three in New Zealand; and two each in Spain, the United Kingdom and Israel. WHO has confirmed deaths only in Mexico, where seven people have died from swine flu. In the United States, California, Indiana and Texas also were reporting additional cases not confirmed by the Centers for Disease Control and Prevention. Meanwhile, Mexican authorities are focusing on a young boy being referred to as "patient zero" by his doctors -- 5-year-old Edgar Hernandez, who survived the earliest documented case of the swine flu outbreak. His family lives in the village of La Gloria in the state of Veracruz, where a flu outbreak was reported on April 2. Lab tests confirmed that he was the only patient in Veracruz to test positive for the swine flu virus; the others had contracted a common flu. Health officials had returned to Edgar's sample only after cases of the new flu strain were spotted around the country. He has recovered from his symptoms. The move means the U.N. agency has determined that the virus is capable of significant human-to-human transmission -- a major step toward a pandemic, but not necessarily inevitable, Dr. Keiji Fukuda said. "In this age of global travel, where people move around in airplanes so quickly, there is no region to which this virus could not spread," said Fukuda, assistant director-general of the WHO. Governments around the world scrambled to prevent further outbreak. In Phase 1 no viruses among animals reported to have caused infections in humans. In Phase 2 animal flu virus is known to have caused infection in humans and is potential pandemic threat. In Phase 3, animal or human-animal flu virus has caused small number of cases in people, but not sufficient for community-level outbreaks. Phase 4 is characterized by verified human-to-human transmission of animal or human-animal flu virus, indicating greater but not inevitable risk of pandemic. Phase 5 means human-to-human spread of virus is confirmed in two countries in one WHO region and pandemic is feared imminent. Phase 6 characterized by community-level outbreaks in at least one other country in second WHO region. This phase indicates global pandemic is under way. The Philippines' health department urged people to avoid kissing and hugging in public. Argentina announced a five-day ban on flights from Mexico. Four cruise lines -- Holland America, Royal Caribbean, Norwegian and Princess -- canceled upcoming calls to Mexican ports. About 35,000 public venues in Mexico City were shut down or told to serve only take-out meals Tuesday, as officials try to contain the outbreak. "I'm pretty nervous of this whole virus thing," Berta Hernandez said as she touched up her eyeliner inside a packed and humid subway car. She did not dare lift her surgical mask to put on lip gloss. "I'm nervous of the people who aren't wearing masks. Maybe they will suddenly sneeze or cough," she said. The U.S. Food and Drug Administration issued emergency authorization for the use of two of the most common anti-viral drugs, Tamiflu and Relenza. The authorization allows the distribution of the drugs by a broader range of health care workers and loosens age limits for their use. The median age of all the U.S. cases is 16 years. In Mexico City, however, there is a shortage of such medication. And the government ran out of surgical masks after handing them out to one out of every five residents. Panicked citizens continue to flood in night and day at hospitals, only to be turned away by armed guards. Swine flu is a contagious respiratory disease that usually affects pigs. It is caused by a type-A influenza virus. The current strain is a new variation of an H1N1 virus, which is a mix of human and animal versions. iReport.com: Do you think we should be worried about swine flu? When the flu spreads person-to-person, instead of from animals to humans, it can continue to mutate, making it harder to treat or fight off because people have no natural immunity. The symptoms are similar to common flu. They include fever, lethargy, lack of appetite, coughing, runny nose, sore throat, nausea, vomiting and diarrhea. The virus spreads when an infected person coughs or sneezes around another person. People can become infected by touching something with the flu virus on it and then touching their mouth, nose or eyes. In 1968, a "Hong Kong" flu pandemic killed about 1 million people worldwide. And in 1918, a "Spanish" flu pandemic killed as many as 100 million people. Putting those figures into perspective about 36,000 people die from flu-related symptoms each year in the United States, according to the Centers for Disease Control and Prevention. Researchers do not know how the virus is jumping relatively easily from person to person, or why it is affecting society's healthiest demographic. "When you think about the flu, the seasonal flu, the flu that we're accustomed to, it typically tends to have the worse ramifications in people that don't have developed immune systems -- the elderly and the very young. They can't fight it off," said Dr. Sanjay Gupta, CNN's chief medical correspondent. "What's counterintuitive with this particular virus, it's in the people who have robust immune systems. As their body starts to respond, to try and fight off that virus, they produce tons of inflammatory cells. Those inflammatory cells can sort of flood the lungs. "So, in essence, it's not the virus itself that's so problematic, but the body's reaction to it." This article incorporates reports from CNN's Mayra Cuevas, Karl Penhaul, Umaro Djau, Saeed Ahmed, Ariel Crespo, Ted Rowlands, Phil Black and Jeanne Meserve, and interviews on Anderson Cooper's show, "AC 360."